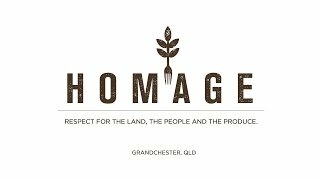 Situated in a historic barn on 12,000 acres of Australian Bushland, Homage is the epitome of fine dining combined with great service. Breakfast, lunch and dinner are served daily in a gloriously elegant setting where you can sit inside or outside on the forecourt with Scenic Rim views. Head Chef Ash Martin pays homage to the region with locally sourced, seasonal produce, including vegetables from the 89 bed onsite market garden, their own bees, and animals raised free range and organically. He also has a smoke house, coal pit and preserving room to explore for a truly immersive experience. Market garden tours are offered daily. Come for an unforgettable and special dining experience, and maybe even stay the night. Breakfast bookings are also popular seven days a week.